Thanks for EVERYONE who has signed up to be a reader! Congrats to 47’s community of readers (come see the photos on the 1st floor) who are now reading the Top 100 books according to Fuse #8 Productions. Special luncheon will be held in June, hosted by reader Terry Acevedo, when we will share our favorites. AND We are ready to do OUR OWN POLL. Think before you submit: What are your Top 5 chapter books for kids/teens? We will assign points and determine (depending on voting) our Top 25 or Top 50 children’s novels! Enter our 47 poll. Poll is open until 6/15. All community members may vote: students in grades 3-8, parents, teachers, and staff! Need help learning how to do something on the computer? Got printer issues? Need to add a digital media or online searching element to your lesson? Next year, I will have a block of time dedicated to addressing these tech needs of all staff. Every Wednesday, see a new comic. Fill in the speech bubble with your own idea! 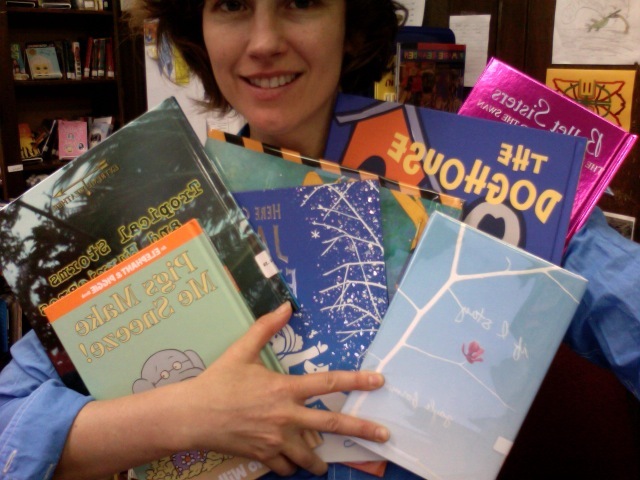 Come see the new PICTURE, SCIENCE, and YA books…a few fiction titles for grades 3-5 too!